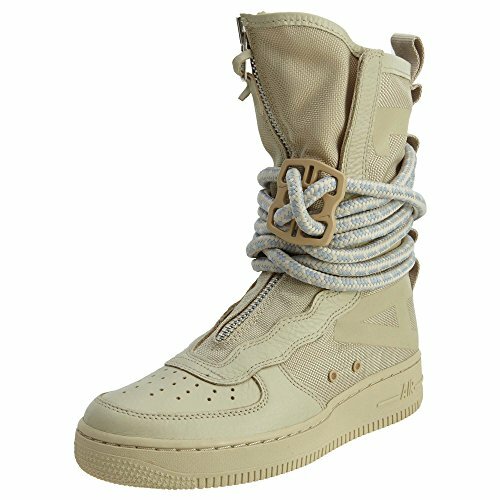 The military-inspired Nike SF Air Force 1 High Women's Boot is built for ultimate urban utility. It features ballistic mesh, a quick-cinch closure system and bold design elements like rope lacing and a reflective AF1 print. Premium leather forefoot and overlays. Rope laces, lace loops and a metal lace lock work together as a dynamic closure system. This gives you a variety of ways to wear and secure your shoe. The heel, collar and tongue are made with a ballistic nylon material. This makes the shoe durable and flexible and gives it a look inspired by military field boots. Reflective AF1 print helps you stand out. Foam midsole with Nike Air cushioning for comfort.